Most of Cindy Van Acker’s stage compositions are genuine experiments. The choreographer likes to coerce movement by some imposed premeditated operation, which she thoroughly tests out in the studio. Most of Cindy Van Acker’s stage compositions are genuine experiments. The choreographer likes to coerce movement by some imposed premeditated operation, which she thoroughly tests out in the studio. This is what could explain her interest in pieces based on formulas, which look like a study. Cindy Van Acker only goes one step at a time, one tentative after the other, selecting different parameters but only a few, in order to better observe the game of their reciprocal influences. The study is always a study of a relation. Relation between sound, light, movement. Between two different rhythms within the same body. Between movement, form, expression and state. Between the body and the mind. All that is generally used in elaborating a piece is objectified, reduced to its starting point: all becomes material to articulate. As a rule, Cindy Van Acker always tests the movement first on her own body, alone, be- fore transferring it onto other bodies. Cindy Van Acker says “I love that a cause produces an effect. This is precisely what I investigate”. And this is what we very clearly read when we have a look at her repertoire, a very clear-cut coherent path. There is a progressive poetics almost as meticulous as a chemist’s task. (…) What is less clear is the fascination these purely formal mechanisms trigger whereas they are completely devoid of all narrative elements. This is where lies the mystery, the beauty, the genius of this exceptional dance as, whilst Cindy Van Acker’s art is abstract, constraint, stripped of any psychology, nonfictional and its only reference, it does stir tremendously strong emotions. 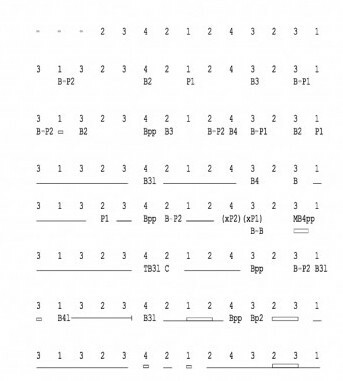 Excerpt from partituurstructuur – Cindy Van Acker’s choreographic scores, directed by Michèle Pralong, Editions Heros-Limit, 2012. Score ‘translated’ by Cindy Van Acker.